This Red Roof in Pensacola is less than one mile away from the West Florida Hospital as well as just a short drive away from the beautiful white sand beaches of Pensacola Beach! Need to catch a flight? We are less than three miles from the Pensacola International Airport (PNS). While youre in the area, explore the campuses of the University of West Florida and Pensacola Christian College. Shop til you drop at University Town Plaza and play a few holes of golf at the Marcus Pointe Golf Club. Go for a hike along the beautiful coasal trails at Big Lagoon State Park and enjoy the exciting rides at the Pensacola Interstate Fairgrounds. Stroll through the exhibits at the Pensacola Museum of Art, then go back in time at Historic Pensacola and the T.T. Wentworth Museum. Visit Five Flags Speedway to experience a live auto race or take part in a Go Cart race of your own at Sams Fun City. End your night with a live concert at the Pensacola Bay Center or Vinyl Music Hall. We are also not far from the Pensacola Naval Air Station. We are close to many nearby restaurants such as The Simple Greek, Dickeys Barbecue Pit, The Egg & I, Tiger Sushi, Jimmy Johns, Moes Southwest Grill, La Hacienda Mexican Restaurant, Texas Roadhouse, Pho Golden Palace Vietnamese Restaurant and Cheddars Scratch Kitchen. 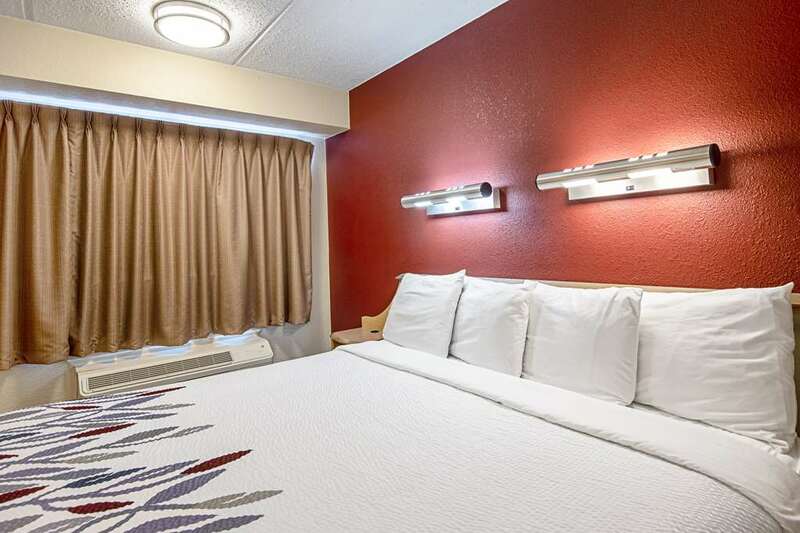 However you decide to spend your day, unwind in our family-friendly hotel. Enjoy our free Verified Wi-Fi and expanded cable package. Stop by our lobby for a complimentary hot cup of coffee or tea and purchase a treat from our snack center. Choose from a variety of nearby restaurants for a delicious meal. One well-behaved pet per room is welcome. This 100 percent Smoke Free Red Roof is located adjacent to University Mall, just 1 miles from West Florida Regional Hospital and within 4 miles of the University of West Florida, Pensacola Christian College, and Pensacola Airport. This Red Roof is also convenient to several restaurants and golf courses.